I dont do this to be a nice guy, I do it because it simplifies things for me and saves time. 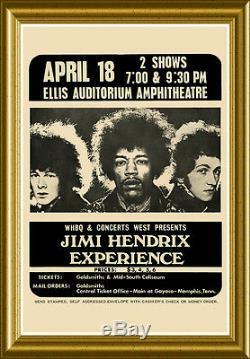 Listed here today is an original, genuine concert ticket stub for the Jimi Hendrix Experience at the famous Ellis Auditorium in Memphis, TN (Elvis Presley played there when he was on Sun Records). It measures 1 and 3/8 inches tall by 1 and 5/8 inches wide at its longest point. It has a few typical creases, which you can see clearly in my photos. The great thing, of course, is that it has "Jimi Hendrix" in its entirety, always the #1 goal of any ticket-stub collector. Just for fun and reference, I've included a photo of the handbill or print advertisement for this event, but the only thing for sale here is the ticket stub itself. Likewise with the cool set of photos actually taken at this very show, which I just borrowed off the internet. 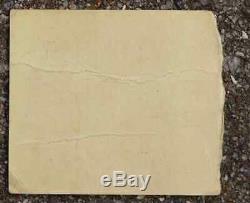 STARTING THIS LISTING AT A BUCK, no reserve, letting the marketplace (you) determine its value. I just prefer to let market forces push any item where it will, and not engage in wishful-thinking pricing. And yes, occasionally an item stiffs, too, and you (not me) get a bargain. I DO NOT CLOSE AUCTIONS EARLY, so please dont ask. As for my credibility, I've had something on display in a music museum every single day since the fall of 1995, when the Rock and Roll Hall of Fame and Museum opened in Cleveland with over 10 of my items on display, including three Beatles Liverpool concert posters. Presently I have two Bob Dylan posters on display at the Country Music Hall of Fame and Museum in Nashville, TN. 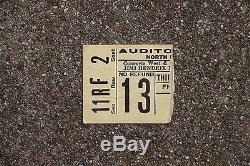 I have over 350 YouTube videos up where I discuss rare and collectible concert memorabilia. You can find them either through my Web sites blog or my YouTube channel, both named PosterCentral. I also worked for CBS Records in the 1970s after being a small-town disc jockey for a few years. Thank you for stopping by, and please let me know if youre aware of any rare concert posters for sale from the late 1960s back to the 1920s. I love to collect vintage concert posters and pay the very BEST prices in the hobby. Whether its Bob Dylan or the Beatles, Jimi Hendrix, the Grateful Dead or Janis Joplin, the Stones or Zeppelin, 50s founding fathers like Buddy Holly, Fats Domino and Elvis, or old-timers like Louis Armstrong, Billie Holiday or Ella Fitzgerald, Im totally into it. Likewise with the earliest & rarest psychedelic concert memorabilia from the Acid Tests, Tributes to Dr. Strange, Sparkle Plenty or Ming the Merciless, and Bill Grahams Mime Troupe benefits in late 65/early 66, rare stuff like that. I also love concert tickets and stubs from my favorite artists. Thanks and have a great day! 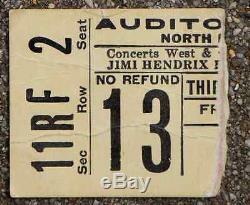 The item "Jimi Hendrix Experience 1969 Concert Ticket Stub Memphis, TN" is in sale since Tuesday, March 29, 2016. 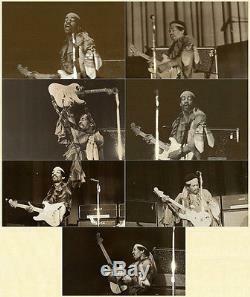 This item is in the category "Entertainment Memorabilia\Music Memorabilia\Rock & Pop\Artists H\Hendrix, Jimi\Other Jimi Hendrix Memorabilia". 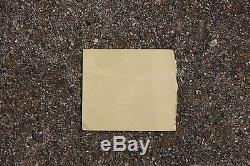 The seller is "mrposter" and is located in San Luis Obispo, California. This item can be shipped worldwide. Size: 1 3/8" by 1 5/8"